There are many different areas worth the time when you vacation in Canada. Depending where you go you can choose to rent a cabin, villa or other accommodations. The important thing is to choose those accommodations that will allow you to make the most of your Canadian vacation at the most reasonable cost. One thing you don't have to worry about when you're planning a trip to Canada is what to do and whether there are enough activities to prevent you or your family from becoming bored during your vacation. While there are certainly many more destinations, there are ten popular places you definitely want to visit when you travel to Canada. Of course, you may not be able to visit them all in the same trip, but you can gain some insight into where you would like to go. 1. For a taste of Canada's French heritage, Quebec City is the place to go. This unique experience will provide a step back into the past with its cobblestone walkways, French cafes, 17th century architecture and the only place other place north of Mexico that still boasts of fortress walls. 2. Cape Breton Island is located at the tip of Nova Scotia and is one of Eastern Canada's Maritime provinces. In spite of its connection to Nova Scotia, the island has a distinct identity of its own and is famous for its Celtic heritage that provides visitors with an array of music, food and charm. 3. Just a two-hour drive from Vancouver takes you to the resort town of Whistler, one of the best ski destinations in the world. This is thanks to the two spectacular mountains that encompass the region: Whistler and Backcomb. Both mountains are a mile above the village and provide over 8000 acres of land perfect for skiing. The town of Whistler offers plenty of year round adventures, great food, spas and a beautiful location to top off your vacation. 4. Algonquin Park in Ontario covers 7,725 square kilometers with a variety of lakes and forests, cliffs and beaches, and bogs and rivers. Visitors to Algonquin can explore the region by foot or in a canoe. It also includes eight campgrounds, 14 trails, various educational programs and an extensive Visitor Center and Logging Center. 5. Toronto is Canada's largest city as well as its financial center. It is the provincial capital of Ontario and is well known for the Toronto International Film Festival. Toronto is also a very popular destination for those who enjoy the theater, second only to New York and London. 6. Niagara Falls is home to the famous Horseshoe Falls, the most powerful North American waterfall and possibly the most well known in the world. It is very popular as a honeymoon destination as well as for romantics. 7. Calgary Stampede is an event that put Calgary on the map while its hosting of the 1988 Winter Olympics made it one of Canada's top vacation destinations. Just an hour outside of town brings you to the Canadian Rockies where you can find an enormous amount of outdoor adventure. 8. Anne of Green Gables Homestead is located on Prince Edward Island National Park. This setting from the novel about a red-haired orphan made this island famous on an international level as it made its way to the map. You will also find sand dunes, fresh water ponds, salt marshes and forests in the park. 9. Your trip to Canada would not be complete without visiting the capital city of Ottawa. While you will find many historic buildings throughout the city, the most prominent ones are the Parliament Building and the Chateau Laurier. Other attractions include the Rideau Canal, the National Gallery of Canada and the Canadian Museum of Civilization. 10. While in Montreal be sue to visit the Montreal International Jazz Festival during June and July. The festival offers approximately 500 concerts most of which are free. Another popular summertime festival is the Just for Laughs Festival. In the winter the Montreal High Lights Festival includes fine food, fireworks and plenty of festivities. 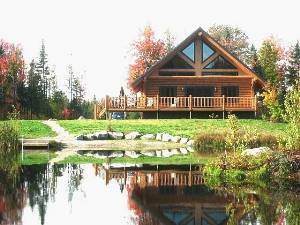 Whether you decide to choose cabin rentals in Canada or other accommodations, you will definitely find plenty to do. Book early in order to locate the best accommodations in the areas you wish to visit.